FEBRUARY 15, 2013, EDMONTON, AB - The Edmonton Prospects Baseball Club are very pleased to announce their 2013 season will be played at Telus Field. After reaching a tenancy agreement in principle earlier this week with the Edmonton Capitals, the Prospects immediately began preparations for another season of baseball at Telus. The Prospects look to improve on their disappointing 6-38 record last year, boasting a much-improved roster, including 14 NCAA Division I players, for 2013. “We had to re-invent the recruitment process. 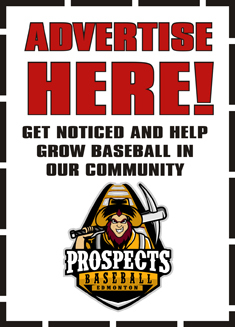 We’ve worked very diligently over the winter and feel this year is easily the most skilled team we’ve had,” said Tracy Neumann, the Edmonton Prospects General Manager. The Prospects will continue to provide the City of Edmonton and surrounding region with exciting, high calibre baseball entertainment at an exceptional value. Fans can expect a tremendous baseball experience at Telus Field along with promotional events and activities providing entertainment for all ages. The Prospects continue to play in the Western Major Baseball League, Canada’s Premier Collegiate Summer League, showcasing top college and university athletes from primarily Canada and the U.S. in a 2-month “sprint” regular season through June and July with playoffs extending into mid-August. Although re-branded as the “WMBL” in 2000, the league’s predecessors date back over half a century in Canada. The Edmonton Prospects will battle teams from Lethbridge, Okotoks, Medicine Hat, Swift Current, Moose Jaw, Regina, Saskatoon, Melville, Yorkton and Weyburn on their quest to win the Harry Hallis Memorial Trophy.